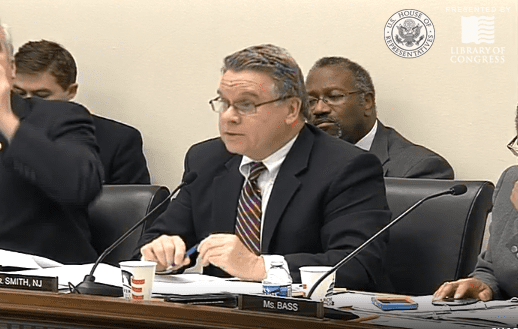 Republican New Jersey Congressman Chris Smith made the anti-gay remark during a House Foreign Affairs Committee meeting on Wednesday where the subject on hand was human rights in Nigeria. "As you know there are fundamental differences in the United States over the whole LBGT (sic) issue. I am a strong believer in traditional marriage and do not construe homosexual rights as human rights. Others have a different view and I certainly respect them." “On a day when 12 men were reportedly arrested for simply attending an alleged LGBT wedding in Nigeria, and as reports keep emerging about the impact of Nigeria’s anti-LGBT law on the lives of Nigerians, it is unconscionable that Representative Smith would not only object to the basic human rights of LGBT people, but argue that their rights should not be part of the administration’s policy in Nigeria,” said Ty Cobb, Director of HRC Global. “It’s simple: LGBT rights are human rights. It’s shocking that Smith — or anyone in his position — would make such close-minded comments to the contrary." “Despite Congressman Smith’s views on civil marriage equality, the Board of Directors of Equality GOP New Jersey have long respected his outstanding record on Human Rights and his courage to fight a just fight for the good of humankind and to promote the dignity and welfare of human life. Mr. Smith’s recent remarks. however, are completely outside the recognized global human rights framework, inconsistent with his solid pro life record, contrary to Catholic teachings regarding violence against LGBT people, and not at all reflective of the values of equality and inclusion that have been the bedrock of the U.S. Republican Party and the values of life and liberty that have been the foundation of American democracy. You can watch the House Foreign Affairs Committee meeting here. Smith's anti-gay remarks come in at 1:42:26.